Whether it is for the treatment of digestive disorders or cancer, the surgical team at Wellington Regional Medical Center has a wealth of experience in using advanced tools and minimally invasive techniques to help make surgery and recovery easier on patients. If you need a referral to a surgeon at Wellington Regional Medical Center, call our free physician referral service at 561-798-9880. Many surgical procedures can be done using minimally invasive techniques. This type of surgery may lead to faster healing and less scarring. Using advanced technology, surgeons make small incisions in the body and use video equipment to provide a magnified view of the surgical site. Instruments are used to perform the surgery through the incisions. This can result in smaller scars, less time in the hospital and a faster recovery. Wellington Regional Medical Center uses the da Vinci® Surgical System, an advanced robotic platform that allows doctors to perform complex procedures using smaller incisions than standard surgery with small tools operated robotically. This may result in less pain, scarring, trauma and blood loss than other surgical procedures so that people can potentially return to work and daily activities more quickly. Wellington Regional Medical Center offers a comprehensive range of surgical and nonsurgical treatment for orthopedic problems. Orthopedic specialists on staff are recognized for their expertise in providing quality care in evaluating and treating a wide range of orthopedic conditions. Weight-loss surgery is about reducing your weight and gaining good health. A healthier weight from surgery can help improve or resolve many obesity-related conditions such as type 2 diabetes, high blood pressure, joint pain, heart disease and more. 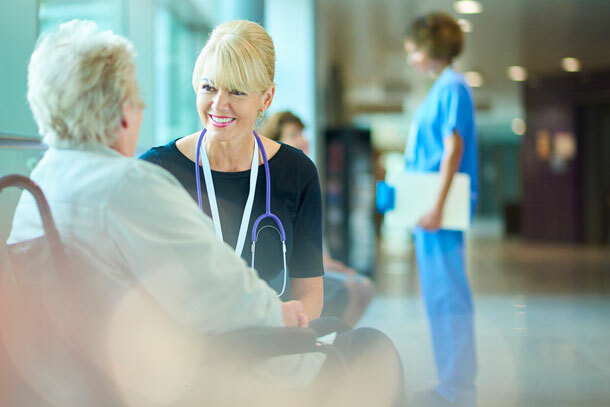 At Wellington Regional Medical Center, we want to be your healthcare partner on this journey.